"This is a plan that Netanyahu put forward, and [US President Donald] Trump supported it. It is about the creation of Greater Israel from the sea to the Jordan River. If he wins, Netanyahu will also annex the West Bank as he promised. Thus, there are growing threats for Palestinians, and the future threats also target Syria", Hawatmeh said at a press conference at Rossiya Segodnya International Information Agency in Moscow. He explained that Syria was endangered by Trump's supporting Israeli claim to Golan Heights that are considered to be an occupied Syrian territory by the international community. The statement comes after Trump called Netanyahu on 10 April to congratulate him on his election victory and pledged the US support for the Jewish state. On the same day, the US president told reporters that Netanyahu's win would help advance the peace process in the Middle East. Parliamentary elections were held in Israel on 9 April. 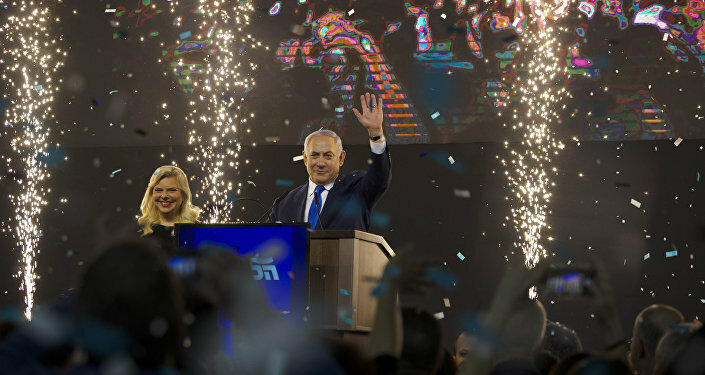 According to the Central Election Committee, Netanyahu's right-wing Likud party is currently winning the Israeli parliamentary elections with 28.32 percent of the vote, while the opposition centrist alliance Kahol Lavan comes second with 25.34 percent of the vote.